Momma Told Me: Cereal is for kids. When you're a child the concept of cereal is associated with cartoon characters and decoder rings nestled at the bottom of translucent bags. We wake up on school days and plop ourselves down at the table or nook to reach for that brightly colored cardboard box full of sugar grain puffs and marshmallows. 'Breakfast' is like morning dessert, as children we only care that it is a quick and sweet treat before beginning the day's grind at school. For me, that's where my bad habit of forgoing breakfast began. 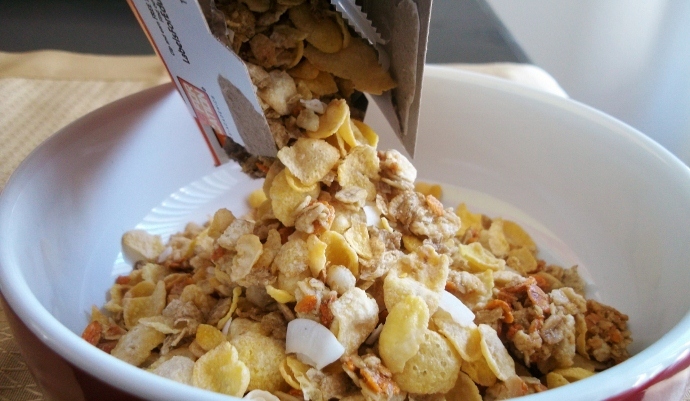 Once I felt I'd outgrown childhood cereals I quickly fell into a sway that involved skipping breakfast all together. Most experts will tell you that's a slippery slope; breakfast is the most important meal of the day. Not only should it be weighted higher (than other meals) in calories, but is necessary to provide the nutrients that fuel us through the day and keep us full until our equally rushed lunch breaks.And eating cereal for breakfast just doesn't seem like the 'adult' thing to do. That's precisely why any child over 5 can easily identify what is casually known as an 'adult' cereal. These usually consist of plain white boxes full of photos of fruit, with nutritional claims in banners across the bottom. But 'adult' cereal doesn't have to be a high fiber compound of compressed oats and void of any flavor. In fact, Post's range of Honey Bunches of Oats has widely been recognized by fans as one of the most flavorful selections among 'sensible cereal'. And the new Tropical Blends flavor is no exception; packaged in a vibrant box of beachy hues, this breakfast cereal will inspire a "party in your mouth" (and that's a direct quote from the other half). Blending trademark Crispy Honey Bunches of Outs Flakes with a tropical Mango flavor, and Coconut Flavored Granola Clusters makes for a textural experience that is anything but boring or bland. Each serving weighs in with 10g of Whole Grain and 9 Essential Vitamins and Minerals, while still coming in below the leading brand of 'adult' cereal (Honey Nut Cheerios) with 2g less of sugar! The Tropical Blends variety is heart healthy and filling; tested here to a proclamation that just a bowl "Just may be the most enjoyable bowl of cereal I have ever had." 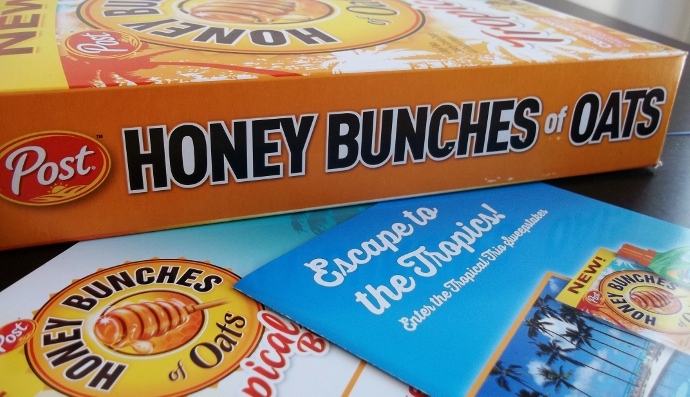 As part of the General Mills brand, Honey Bunches of Oats Tropical Blends is a participating title in the Labels for Education program which donates a portion of money back to schools. 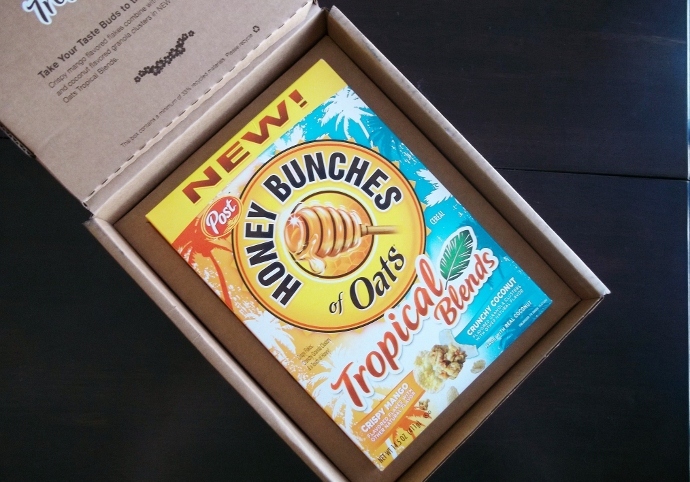 But that's not the only reason to hunt down a box of this new blend; The Purex® brand is teaming up with Honey Bunches of Oats and Outrigger Hotels and Resorts to launch a monumental prize giveaway: The 2013 Tropical Trio Sweepstakes! That's right, Purex has a brand new scent in their Natural Elements Liquid Detergent; Tropical Blast, and they're teaming up to offer an amazing prize in hopes of spreading the word. In addition to a Grand Prize that will send one lucky entrant on a tropical paradise vacation to Outrigger Waikiki, 5 First Place winners will enjoy a year's supply of Tropical Purex and Honey Bunches! 100 Second Place winners will also receive coupons good for free Purex and Honey Bunches product, so don't hesitate to head on over and enter TODAY, and look for the new Honey Bunches variety on shelves in a store near you! What Daughter Says: Enjoy the grown up cereal with big flavor and plenty of tropical texture, look for new Honey Bunches of Oats Tropical Blends on a shelf near you! One Momma Told Me follower will win 3 vouchers good for FREE Honey Bunches of Oats! Enter our Soft Scrub Total giveaway here. Enter our Dial Tropical Body Wash here. The Honey Bunches of Oats. I've been waiting to find them in my local store. Oops! My comment was about the HBOats. Purex probably wouldn't be delish. I'd pick the Purex. Although the Honey Bunches of Oats does sound pretty yummy! I'm definitely more interested in the cereal. :) We love HBO! I'd probably pick the Purex, although my family loves Honey Bunches! Thanks for the chance to win! I'm equally excited about both! I'm more excited about the Purex! I love the idea of the Purex Crystals and plan on searching them down at the store. The Honey Bunches! My family loves the cereal. The Honey Bunches of Oats for sure! The Honey Bunches of Oats would excite me more.